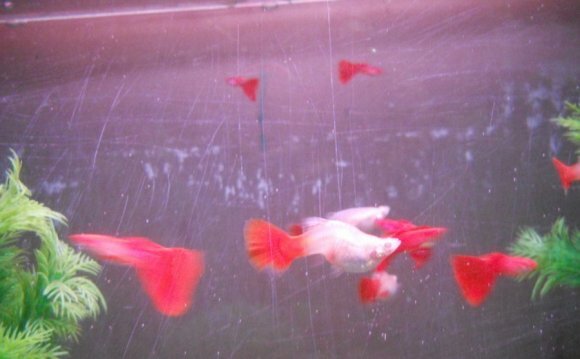 Female betta fish typically have shorter fins than male bettas. While female betta fish are more drab in coloration than the males, they can still be a pleasure to keep. Unlike male bettas, you can keep more than one female in a single tank; in fact, you may be able to add them to a community tank. Select a tank for your female bettas that is at least 10 gallons in capacity. Up to five female bettas can safely coexist in a 10-gallon tank - a 20-gallon tank is recommended for more than five female bettas. Line the bottom of your female betta tank with a dark gravel or sand substrate to give the tank a natural appearance and to bring out the best coloration of your betta fish. If you prefer to add some color to your tank, try using colored glass marbles or colored gravel. Fill the tank with tap water and treat it with an aquarium water conditioner. Water conditioners help to remove harmful chemicals and toxins like chlorine from tap water to make it safe for aquarium fish. Decorate your betta tank with plenty of live plants, rocks and pieces of driftwood. Though male bettas are notorious for being aggressive, females of the species can become aggressive and territorial as well. To avoid problems it is important that you provide plenty of hiding places. Install your aquarium equipment including an aquarium heater and a filter. Follow the manufacturer's directions for installation. Set the thermostat on the aquarium heater to a temperature in the range of 72 to 80 degrees Fahrenheit. Betta fish can tolerate cooler or warmer temperatures, but this is the range they prefer. Let your female betta tank run for at least one week before you introduce any fish. This will give the tank time to cycle - to build up a colony of beneficial bacteria that will help control the ammonia levels in your tank. Introduce all of your female betta fish to the tank at one time so each fish can establish her own territory. If you are able to get female bettas that all come from the same spawning, they will have a better chance of getting along. Stick to odd numbers when stocking your female betta tank - keep three or five betta fish in a 10-gallon tank and seven or nine in a 20-gallon tank. Keeping odd numbers of fish will encourage your female bettas to establish a natural pecking order, with one betta as the dominant female. Feed your female betta fish small amounts of food twice a day. If you plan to use betta pellets, offer no more than four pellets per fish per day. Use live and frozen foods sparingly because if you feed betta fish too much rich food it could lead to digestive issues. Perform weekly water changes of 20 percent of the betta tank volume by siphoning out some of the dirty water from the substrate and replacing it with fresh, dechlorinated tap water. Make sure the new water is the same temperature as the water in the main tank to avoid shocking your bettas with a drastic temperature change. Keep an eye on your female bettas to make sure they are getting along. Occasional squabbles are normal; but if one of your bettas is being constantly antagonized, you may want to remove it from the tank before it gets injured or falls ill from the stress. If you plan to add a female betta to your community tank, be sure to provide plenty of hiding places so your betta fish can establish her own territory in the tank. Avoid keeping female betta fish in a community tank with particularly large or aggressive species.